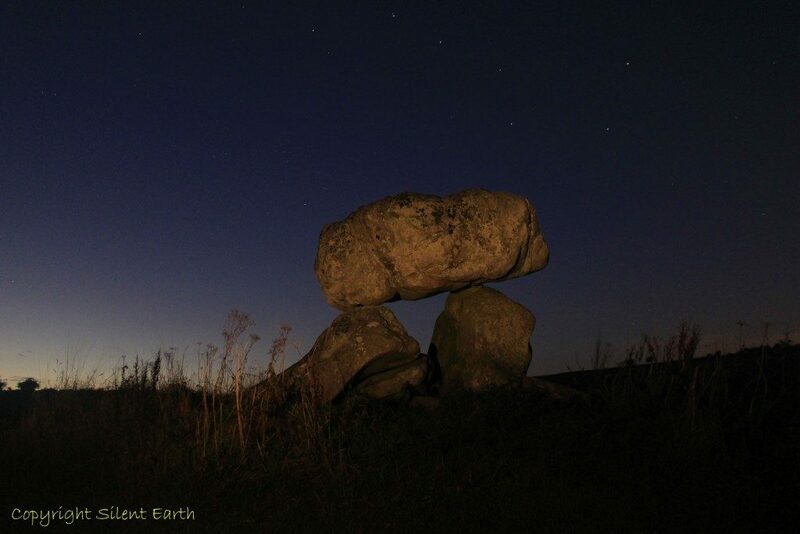 On Wednesday 26 October 2016, as I left Devizes with Pete Glastonbury, the photographer and antiquarian who was guiding me to Devil’s Den near Marlborough in Wiltshire for a night photography session, the late afternoon skies were leaden and showing little prospect of a clear night sky for the evening ahead. 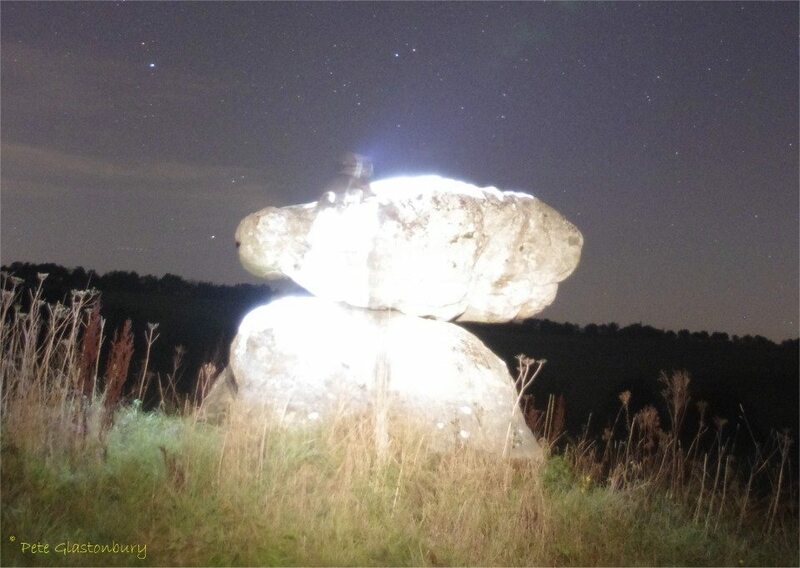 In 2009 Mr Glastonbury similarly guided a gentleman who authors the Northern Antiquarian blog to Devil’s Den, resulting in a subsequent highly informative blog post here and an additional article on the cup marks on top of the capstone here. Parking was not available at the beginning of the footpath approaching the site from Clatford to the south, as the farmer had posted notices on the gates stating ‘vehicles will be removed’. After leaving the car in a nearby lay-by, we returned to the byway. As we approached the path, we inadvertently disturbed the natural tranquility that two buzzards were basking in, and they immediately flew north. Below: A first distant view from the southeast. As we approached the site, the sun had already fallen behind Fyfield Hill (also known as White Acre) to the west, and the earlier leaden skies had started clearing. 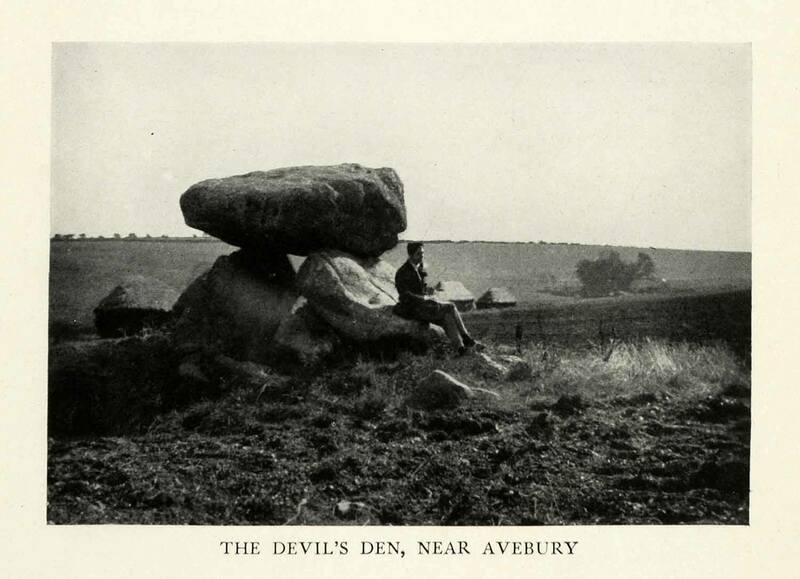 I was informed that this valley is referred to locally as ‘Delling Dean’ from which the name of Devil’s Den may have originally evolved ‘After the habit of old time of attributing all megalithic monuments, or stupendous earthworks, to the arch fiend.’ (Reverend A.C. Smith, 1884). 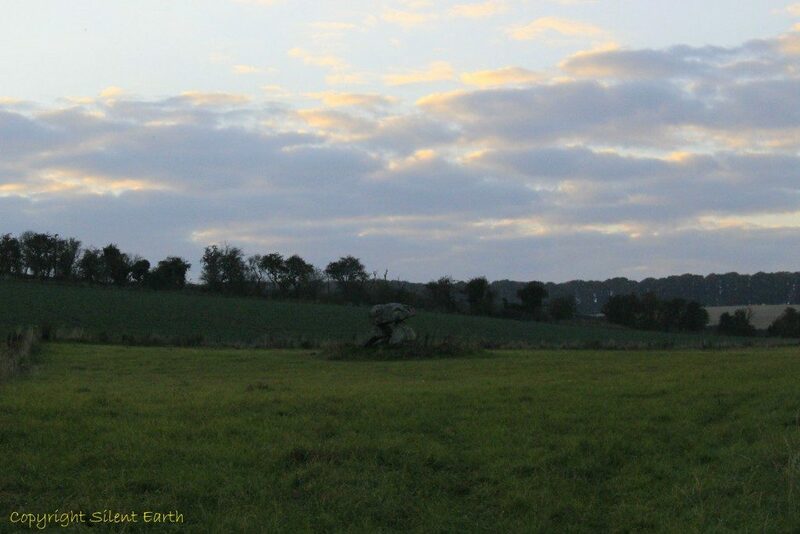 On arriving at the site, we noticed in the distance, alert and silently standing in an adjacent field to the southeast, a female deer, motionless and staring at us. My attention wavered momentarily and, looking again, she was gone. ‘Another labourer whom I once interrogated informed me that nobody could ever pull off the capstone; that many had tried to do so without success; and that on one occasion twelve white oxen were provided with new harness, and set to pull it off, but the harness all fell to pieces immediately! As my informant evidently thought very seriously of this, and considered it the work of enchantment, I found it was not a matter for trifling to his honest but superstitious mind; and he remained perfectly unconvinced by all the arguments with which I tried to shake his credibility.’ – The Rev. 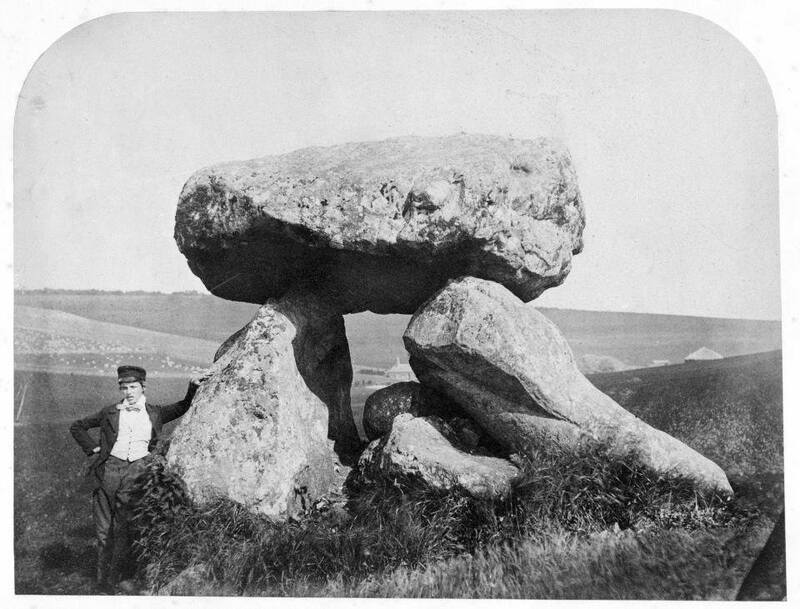 A.C. Smith, Guide to the British and Roman Antiquities of the North Wiltshire Downs (1884). 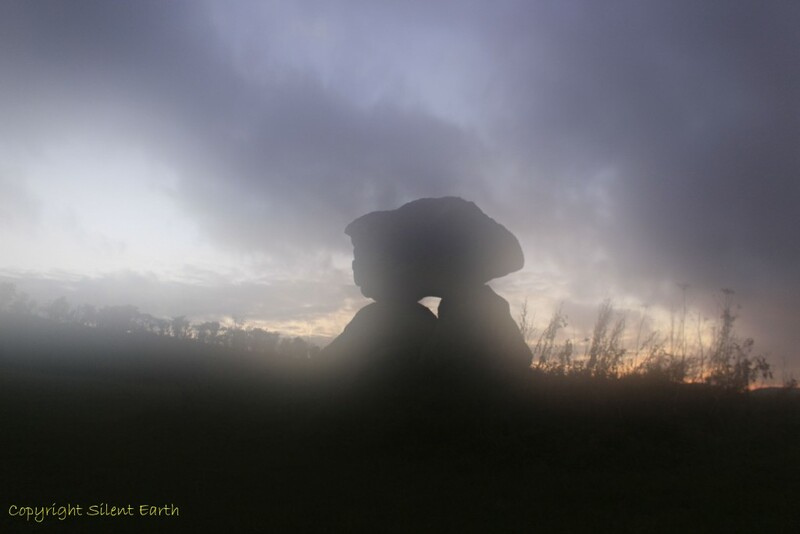 Below: After sunset, at twilight a light mist started rising from the valley floor. 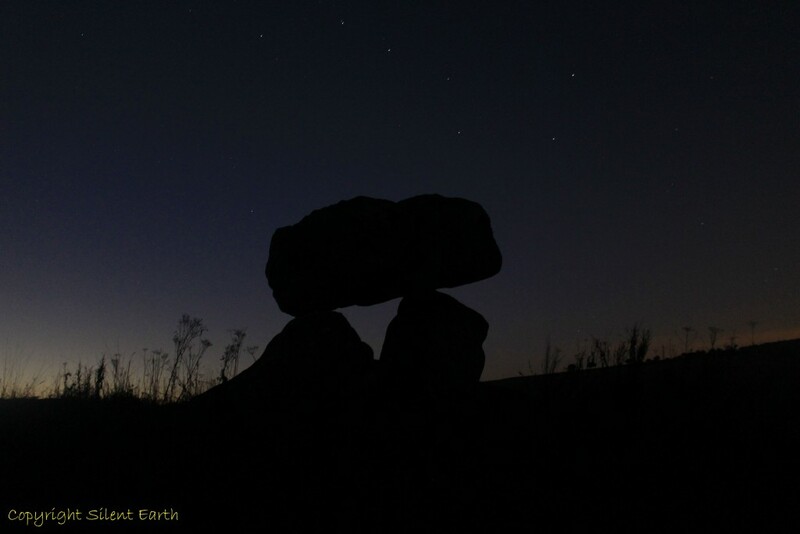 The almost complete silence was broken by the honking sounds of a large flock of geese flying over Devil’s Den, approaching from the south in a V formation. As they unhurriedly flew northward, a number of birds moved up from the back of the flock and took more advanced positioning in the group. Below: Straw barns are visible to the west in this photograph. We were blessed with clear night skies, shortly after which the elusive Milky Way revealed its serpentine lustre above our heads. 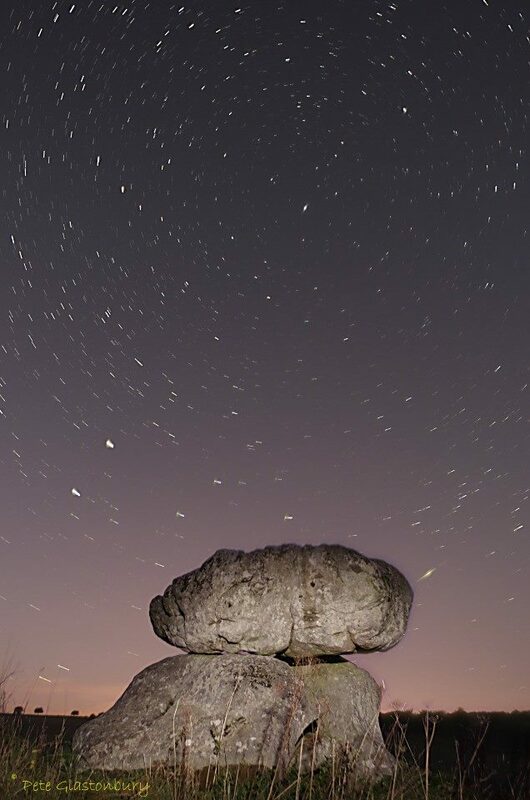 A Draconid meteor blazed across the sky to the southwest, which we both witnessed, unfortunately at this time our cameras were photographing the monument and we did not capture the moment. 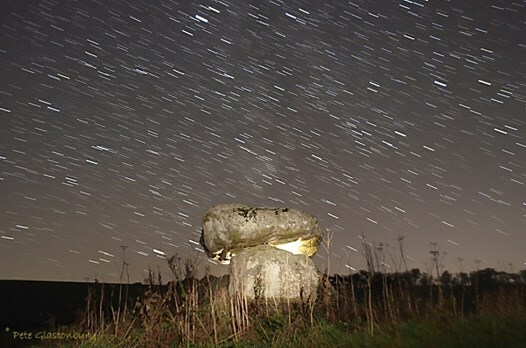 Below: The constellation of The Plough to the north and above Devil’s Den. By now the virtual silence was broken only occasionally by the hooting of a tawny owl from nearby woods. 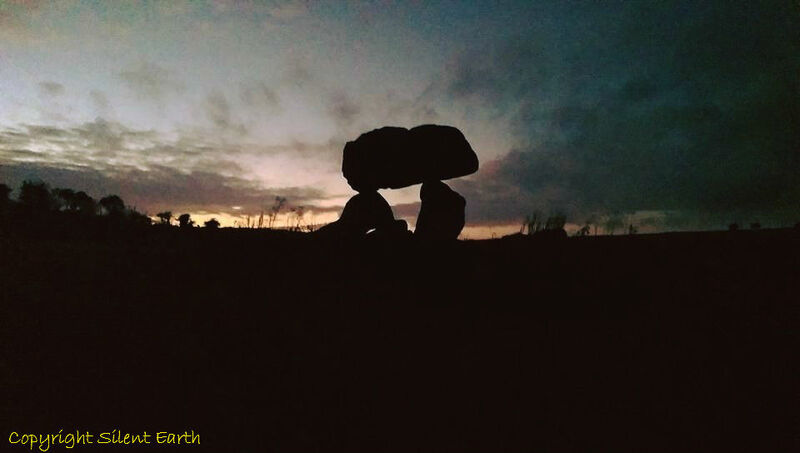 More on the associated folklore and tales of the site here. The light veil of mist which rose earlier from the valley floor was now hankering to be entwined with nearby thick banks of fog making their way to the den and threatening to cut short our vigil from dusk til dawn. 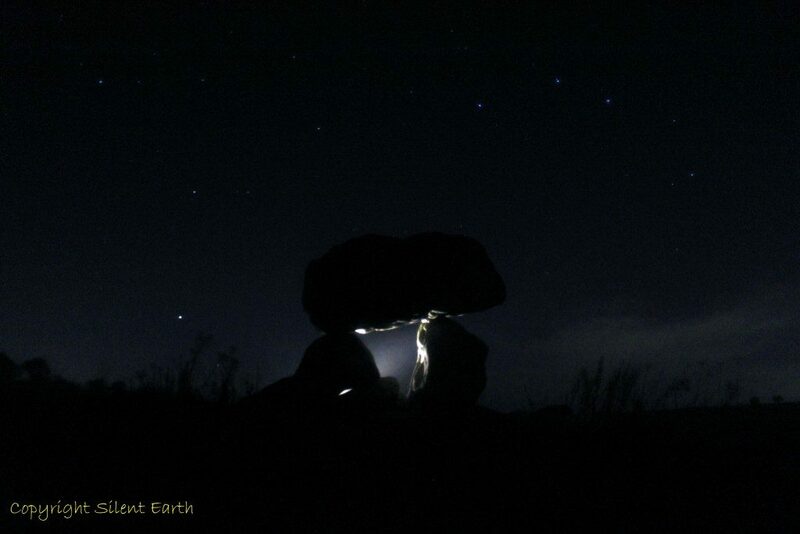 With the fog inexorably encroaching, thickening across the valley and beginning to envelope Devil’s Den, we decided to pack up our photography equipment and make our way back along the path to the sanctuary of the car. Before leaving, Mr. Glastonbury took one final photograph, below. Could it be that he captured atop the capstone that ‘thirst-tormented fiend’ of legends long ago? Thank you Pete Glastonbury for use of the photographs and as guide on the day. 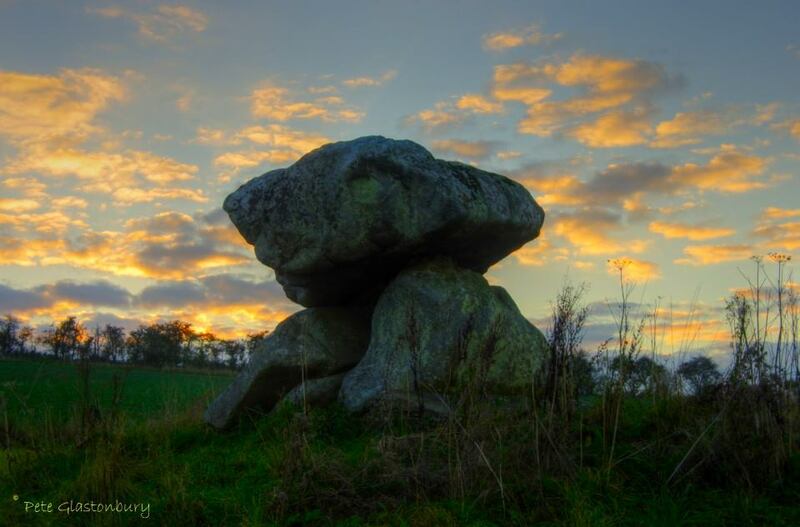 Additional information on the site is here on The Megalithic Portal and here on The Modern Antiquarian.